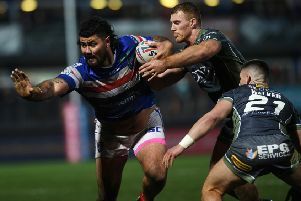 Wakefield Trinity Wildcats will travel to the AJ Bell Stadium to face Salford Red Devils in their opening game of the Super 8s qualifiers. The tie will take place on Sunday August 9, kick-off 3pm. Ticket information for this fixture will be released in due course. The first home fixture for Wakefield comes in the second round on Saturday August 15, kick-off 3pm, when they face Kingstone Press Championship side Bradford Bulls. Trinity will then travel to Championship leaders Leigh Centurions on Saturday August 22, kick-off 3pm. The Wildcats’ final game of qualifiers will be away to Sheffield Eagles at Bramall Lane on Sunday September 27, kick-off 3pm. Dates and times are subject to change for television after the fifth round. Sky have chosen to show Trinity’s fixtures against Bradford Bulls and Leigh Centurions.